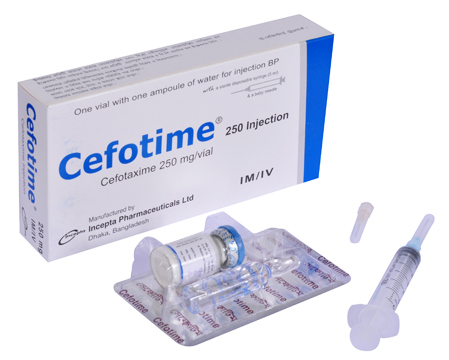 Cefotime 250 IM/IV: Each vial contains Cefotaxime 250 mg (as sterile powder of Cefotaxime Sodium BP). 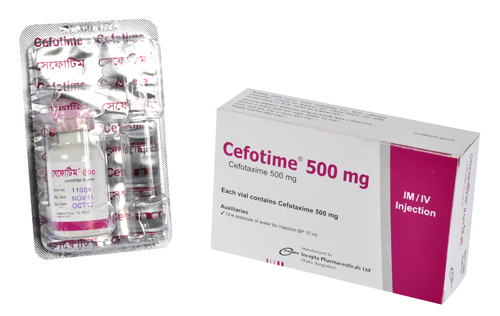 Cefotime 500 IM/IV: Each vial contains Cefotaxime 500 mg (as sterile powder of Cefotaxime Sodium BP). 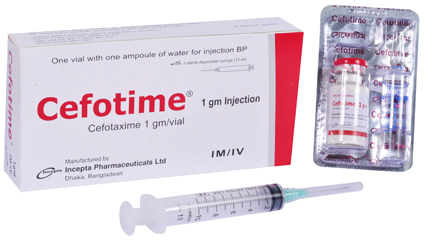 Cefotime 1 gm IM/IV: Each vial contains Cefotaxime 1 gm (as sterile powder of Cefotaxime Sodium BP). Cefotaxime is a broad spectrum bactericidal 3rd generation parenteral cephalosporin antibiotic. Cefotaxime is exceptionally active against gram-negative organisms sensitive or resistant to first or second generation cephalosporins. It is similar to other cephalosporins in activity against gram-positive bacteria. • Cefotime is indicated for the treatment of patients with serious infections caused by susceptible strains of the designated microorganisms in the diseases listed below. • Lower respiratory tract infections, including pneumonia, acute or chronic bronchitis, bronchiectasis, lung abscess and post-operative chest infections. - Urinary tract infections, including acute and chronic pyelonephritis, cystitis and asymptomatic bacteriuria. - Obstetric & gynecological infections, including pelvic inflammatory disease. - Skin and soft tissue infections, such as - cellulitis, wound infections. - Intra-abdominal infections including peritonitis. - Bone and joint infections, e.g. osteomyelitis, septic arthritis. - Central nervous system infections, e.g. meningitis. - Uncomplicated gonorrhea, particularly when penicillin has failed or is unsuitable. - Surgical prophylaxis: The administration of Cefotaxime prophylactically may reduce the incidence of certain post-operative infections in patients undergoing surgical procedures that are classified as contaminated or potentially contaminated or in clean operation where infection would have serious effects. The recommended dosage for mild to moderate infections is 1 gm every 12 hourly. However, dosage may be varied according to the severity of infection, sensitivity of causative organisms and condition of the patient. In severe infections dosage may be increased up to 12 gm daily given in 3 or 4 divided doses. For infections caused by sensitive Pseudomonas spp. daily doses of greater than 6 gm will usually be required. The usual dosage range is 100-150 mg/kg/day in 2 to 4 divided doses. However, in very severe infections doses of up to 200 mg/kg/day may be required. The recommended dosage is 50 mg/kg/day in 2 to 4 divided doses. In severe infections 150-200 mg/kg/day in divided doses have been given. A single injection of 1 gm may be administered intramuscularly or intravenously. Immediately prior to surgery, a single dose of 1 gm is suitable for most of the procedures. For procedures longer than 4 hours a dose of 2 gm is recommended. Because of extra-renal elimination, it is only necessary to reduce the dosage of Cefotaxime in severe renal failure (GFR<5 ml/min = serum creatinine approximately 751 micromol/litre). After an initial loading dose of 1 gm, daily dose should be halved without change in the frequency of dosing. Cefotaxime may be administered by intravenous infusion. 1-2 grams are dissolved in 40-100 ml of water for injection BP or 0.9% Sodium Chloride injection BP or 5% Dextrose injection BP. The prepared infusion should be administered over 20-60 minutes. Adverse reactions to Cefotaxime have occurred relatively infrequently and have generally been mild and transient. Effects reported include candidiasis, rashes, fever, transient rises in liver transaminase and/or alkaline phosphatase and diarrhoea. As with all cephalosporins, pseudomembranous colitis may rarely occur during treatment. If this occurs, the drug should be stopped and specific treatment instituted. As with other cephalosporins, changes in renal function have been rarely observed with high doses of Cefotaxime. Administration of high doses of cephalosporins particularly in patients with renal insufficiency may result in encephalopathy. Hypersensitivity reactions have been reported, these include skin rashes, drug fever and very rarely anaphylaxis. Cefotaxime should be prescribed with caution in patients with a history of colitis. Because high and prolonged antibiotic concentrations can occur from usual doses in patients with transient or persistent reduction of urinary output because of renal insufficiency, the total daily dosage should be reduced when Cefotaxime is administered to such patients. Continued dosage should be determined by degree of renal impairment, severity of infection, and susceptibility of the causative organisms. Cefotaxime is pregnancy category B drug. Although animal studies have not shown any adverse effect on the developing fetus, the safety of Cefotaxime in human pregnancy has not been established. So, Cefotaxime should not be administered during pregnancy especially during the first trimester, without carefully weighing the expected benefits against the possible risks. As Cefotaxime is excreted in human milk, either breast feeding or treatment of the mother should be stopped.